I went for a short wander yesterday, Sunday, going back to the Ouse to see how the ings lands were looking after the floods. The photo above was taken on Sunday 27 Dec, and featured on an earlier page. 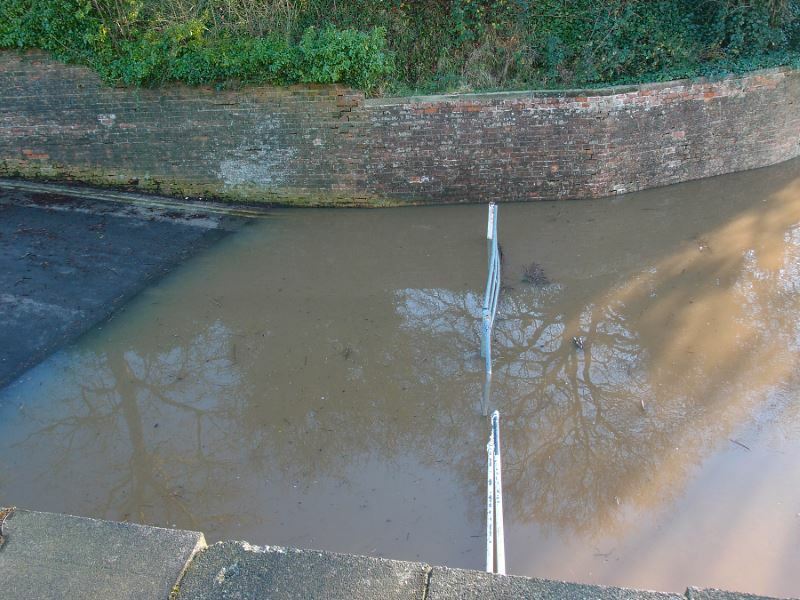 The photo below was taken from the same place on Sunday 10 January, two weeks later. As we can see, the waters have retreated here on the Leeman Road side, enough for people to be out walking their dogs in what looked like a lake two weeks ago. 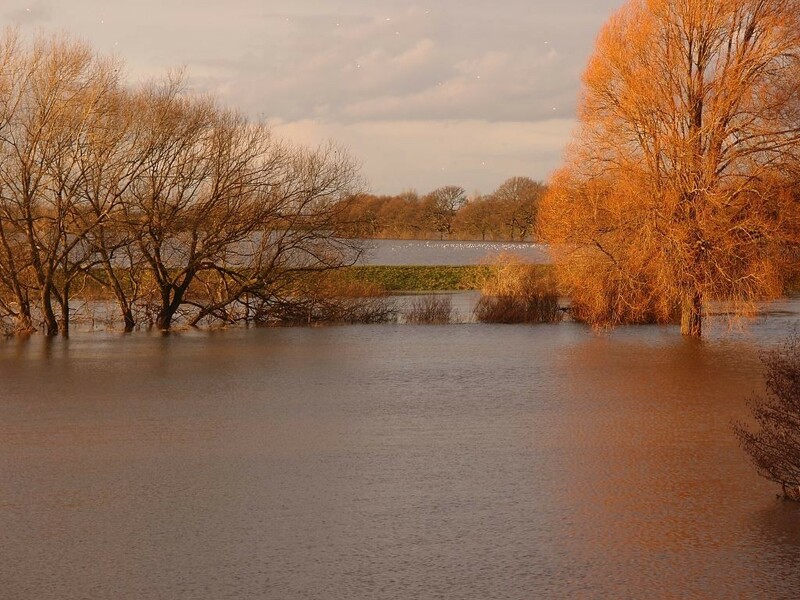 The Ouse though is still beyond its usual banks. In normal conditions the strip of dry land pictured below has the Ouse to the left of it, rather than to the left and the right. 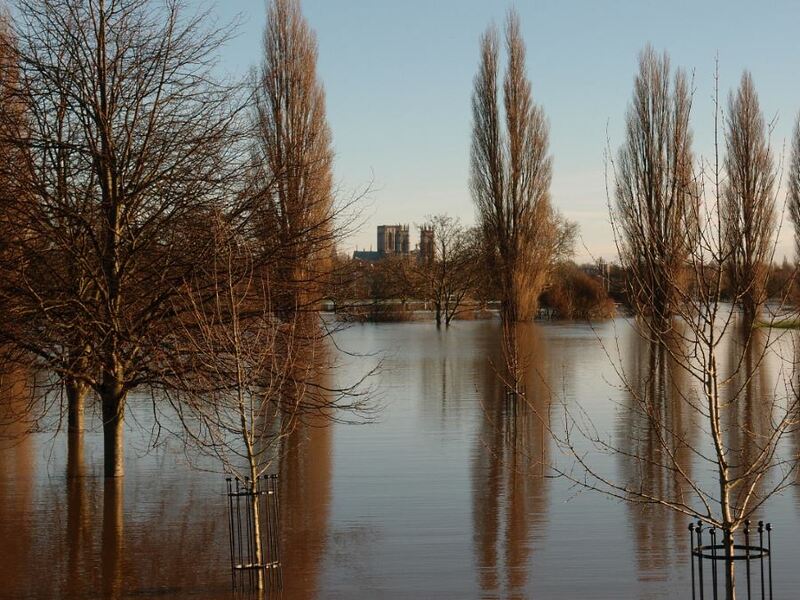 If we cross the road at Water End and look out across the ings and the Ouse the other way (looking out of town, upstream) there’s still a lot of floodwater. It doesn’t seem to have dropped much, over the course of a fortnight. 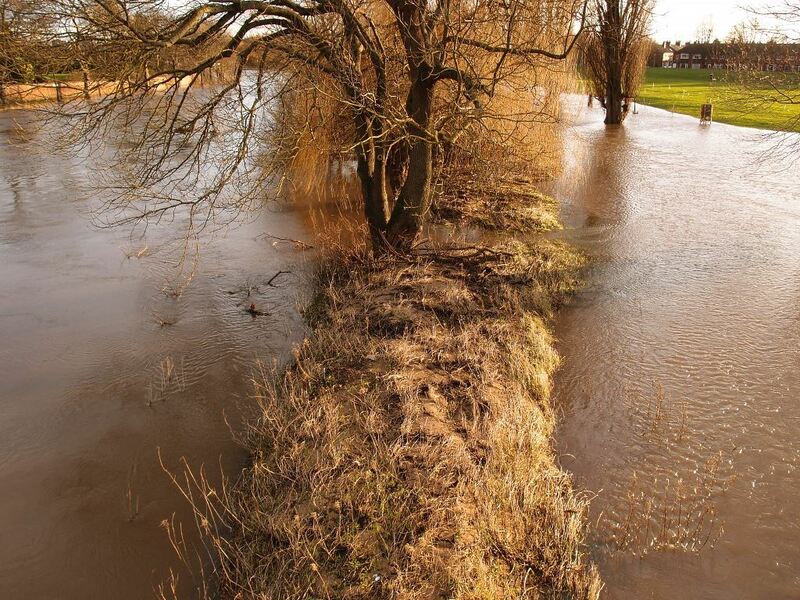 In the photo below, the green strip across the middle of the photo is the floodbank created to hold in water from the overflowing Ouse, to reduce the levels downstream, as discussed on a page some years ago. 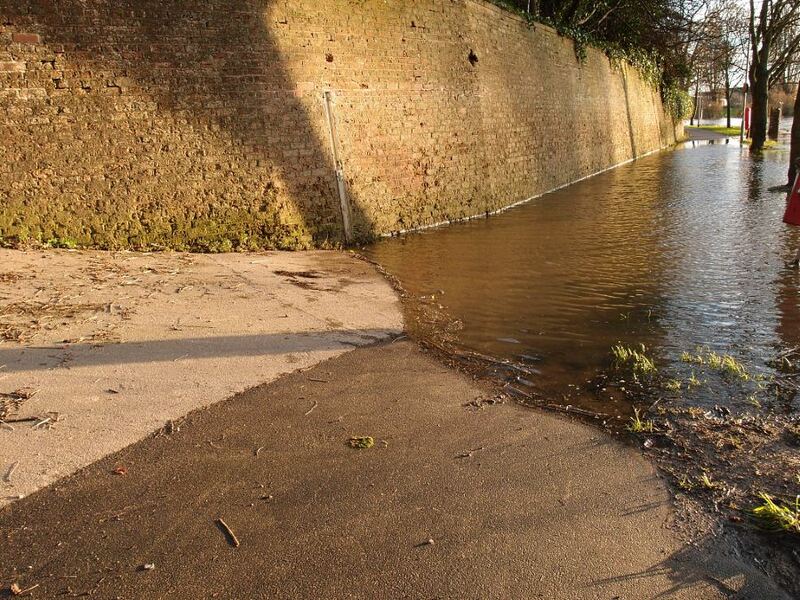 On 27 December, standing here on Water End, I could barely see the floodbank, which appeared to have so much water behind it that some of it looked to be spilling back over. So the level has dropped a bit, but not much. Not as much as I expected it might have, after a fortnight. The white dots on the water are gulls. 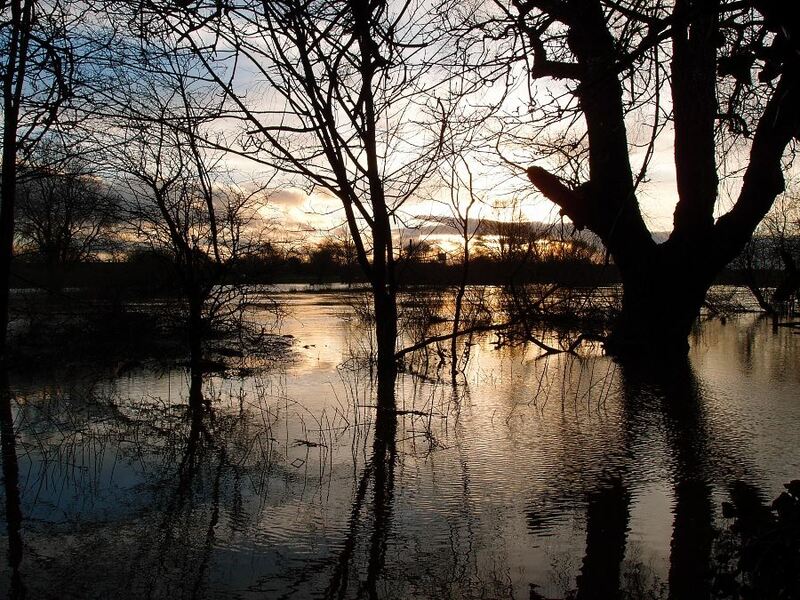 They often congregate on these watery ings lands, in times of flood. On 10 Jan, two weeks on, I was able to walk down and stand where those floodwaters had been. Looking at the riverside path towards town, it was clear that levels hadn’t dropped dramatically enough for me to take a stroll that way. Water under the bridge … as is usually the case when the river’s high, but thankfully the gate on the higher part was open. Hurrah, let’s see how far we can get along the riverside path. … but not for long. Seconds later, the dry path becomes another watery place. River to the left, and river on the path. How disappointing. I guess I’ll have to turn back. I didn’t turn back though, as an alternative route suggested itself. I’ve walked and cycled along here many times over the years. 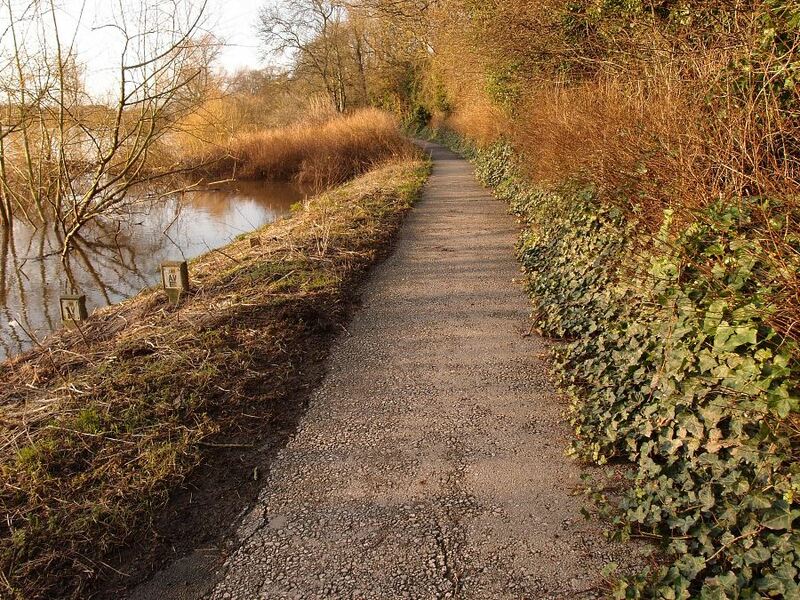 To the right of the tarmac path there are trees and a tangle of ivy and other vegetation, and land rising up away from the river. It’s just a thin strip of land, left to go wild. 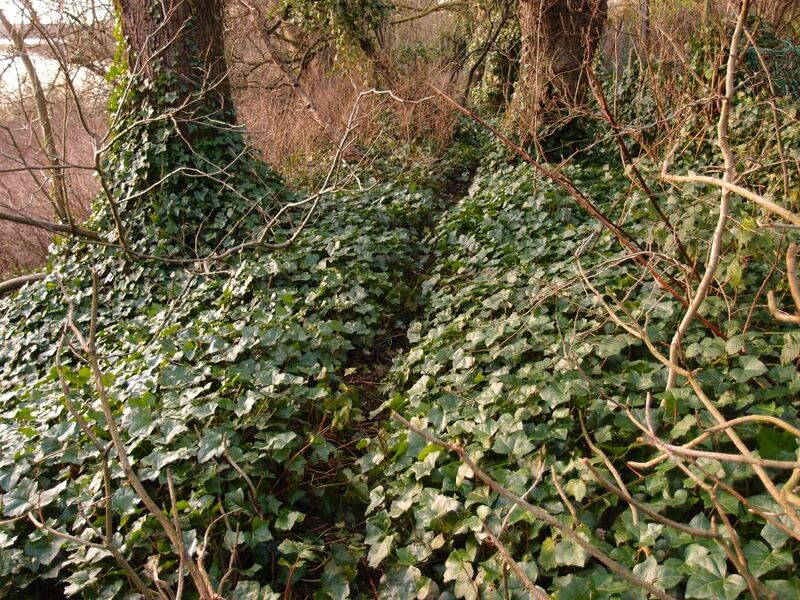 Through the carpet of ivy on this bank there are a few narrow muddy tracks leading upwards away from the river. I’ve been vaguely curious about them, but never curious enough to climb up there. 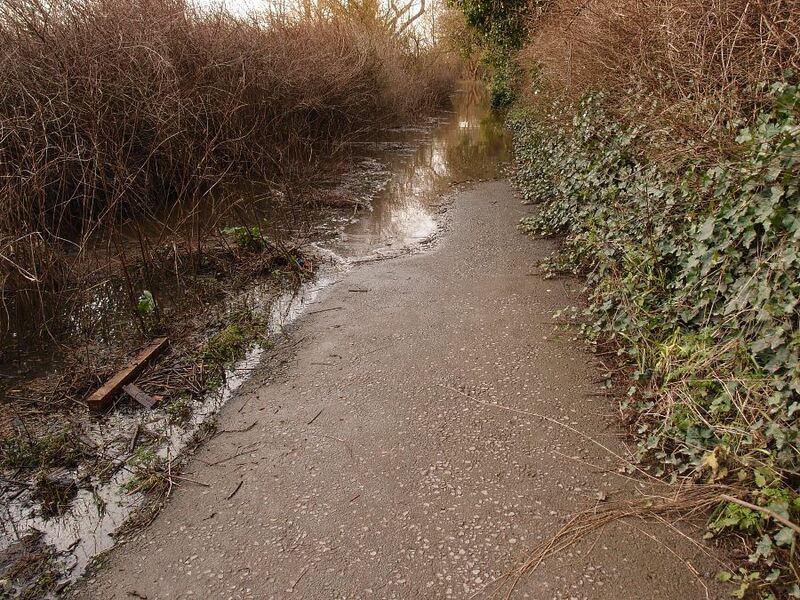 This afternoon, with floodwater preventing further progress on the normal path, I thought I would. Clambering up the slope into the ivy and trees I walked along this higher level path, littered with the usual rubbish, all unkempt, but clearly fairly well-used, the litter suggested. Then I noticed this rusty old thing. 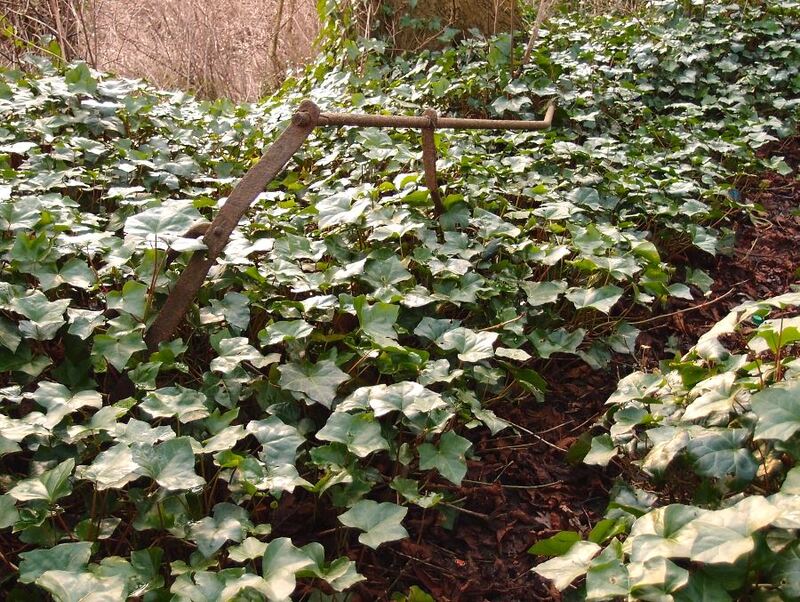 Bent and collapsing, it was still recognisable as a railing, a simple guard rail, on the outside of the path where the land dropped down to the lower path and the river beyond. Apparently used a long time ago, in an age before littering pleasant places with empty lager cans became common practice. The path went on for only a short stretch, behind the playground of the Homestead Park, visible through a wire fence, then dropped down again, back to the floods. No further progress possible. 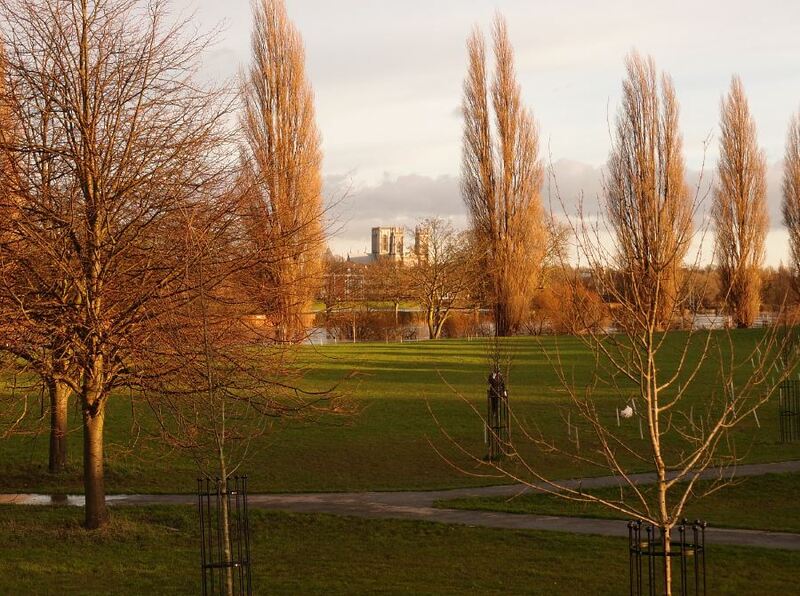 I just stood there a while and looked out across the watery expanse, towards Holgate and Acomb, the water tower just visible in the distance through the winter trees. Then headed back. 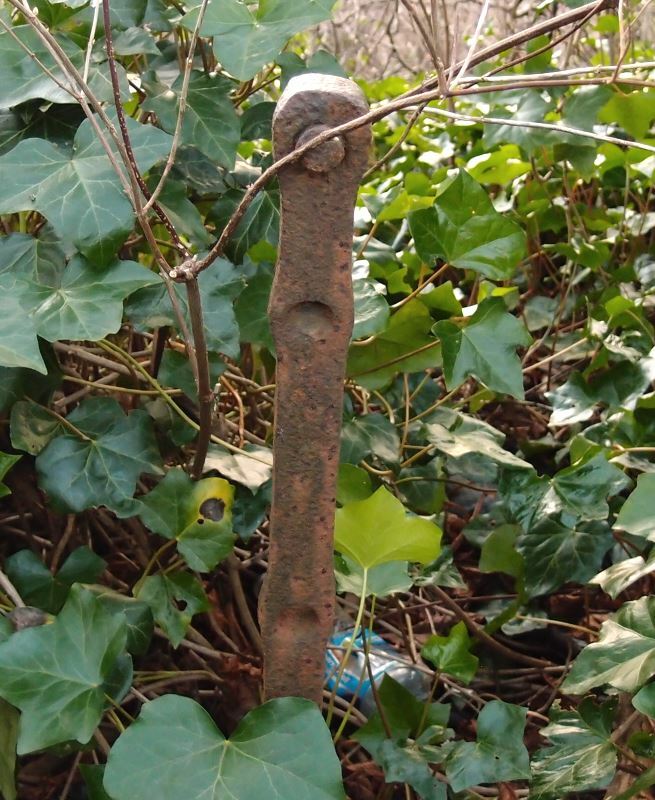 Passing another rusty remnant of guard rail, forgotten and redundant in the ivy and shrubbery, under trees mature enough perhaps to have been there when this path was well-used enough to need a guard rail, before the lower level tarmac path took over as the preferred route. Descending to the tarmac path I met a man and his son out for a bike ride, heading out of town, as I’d tried to. He asked if they could get through ahead. I looked doubtful and said I didn’t think so, that I hadn’t been able to, they might be able to on bikes. The son urged his dad to have a go. I sounded like a nannying fussbucket perhaps, cautioning against endangering themselves, though said with a laugh. The man said, as they cycled off, ‘it’s only a bit of water’. They soon reappeared, presumably realising that it was more than a bit of water, and really quite a lot of water. I was still standing on the path, looking up at what would have been the course of that higher-level walkway, trying to imagine how it worked, where it started, before the massive concrete structure we know as Clifton Bridge appeared here, cutting through the old landscape, bridging the river, in the 1960s. When I got home, I looked for images I remember seeing before, of Water End on the Clifton side, before the bridge was built. Here’s one, from around 100 years ago. If we were standing in the same place now we’d have Clifton Bridge stretching out before us. 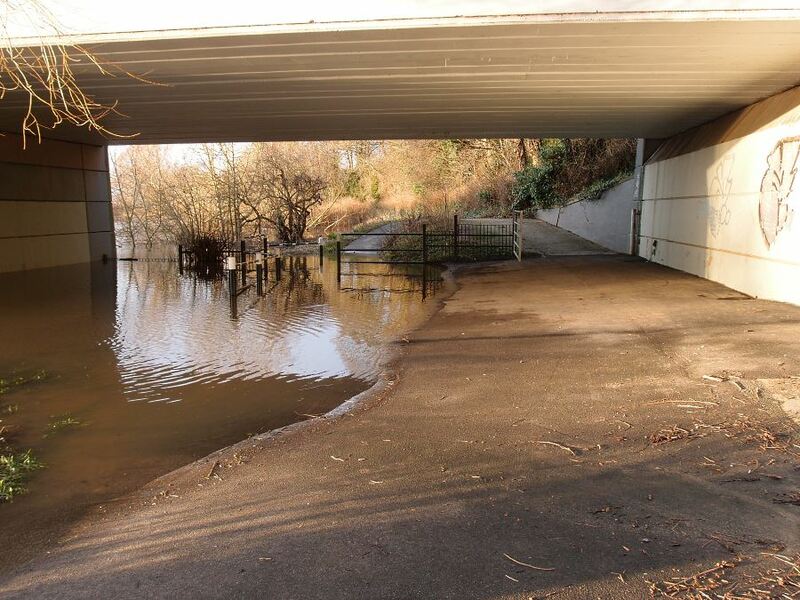 The slope down to the river is still there, to the left of Clifton Bridge. To the left of that, the tall brick wall is still there, as pictured on photos above. 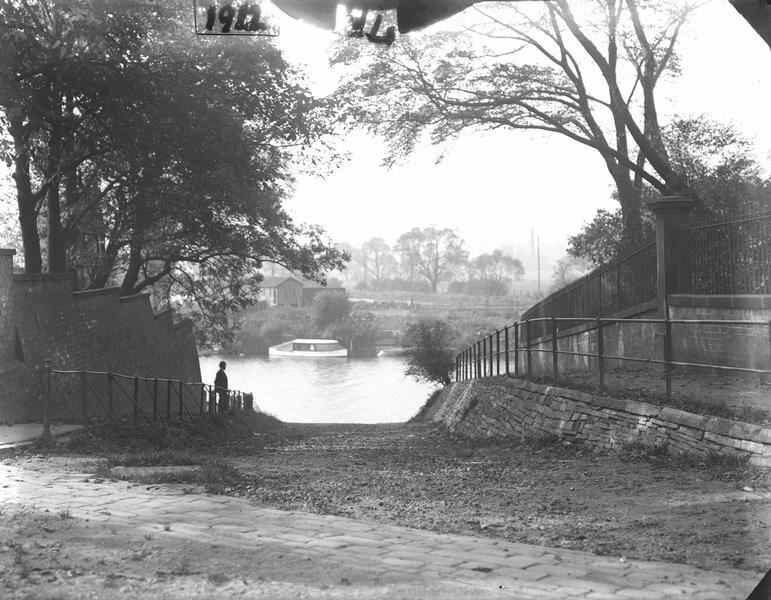 The slope here used to lead to the ferry, taking people across the river to the Leeman Road side. On the right of the photo, a pathway bends round to the right, with a plain iron guardrail, two horizontal bars between uprights. Leading to what must have been a very pleasant riverside promenade high up and still accessible in times of flood. Rusty remnants of its railings still there in the trees. Many years ago I did some family history research and found that ancestors on my dad’s side lived here in Clifton at the turn of the 19th century, in housing that was cleared to make Clifton Dale, then in Abbey Street. One of my great-grandmothers lived there for decades, into her 90s. I didn’t know that when I moved to the Clifton area 25 years ago, but I’ve always felt at home here, and have since wondered if that has something to do with it. When I saw the rusted redundant railing on a forgotten walkway above the Ouse I thought about how you can live in a place for so long and still have new things to find, when forced from the usual ways and the beaten track. And thought about all the people back then walking this way, how our tracks through the ivy still lead to the old way, where they walked. Only though when sitting down to write this did I think about my own family history and the Welbys in Clifton, and how they might have walked along here when the railings weren’t rusting and the ferry took people over the river. So many layers. And that’s why I keep writing these York Stories, even though it makes no money and sometimes feels like a waste of time and effort. Sometimes it flows, just like the river, and it seems best to go with it, when it does. Beautiful pictures, thoughtful words and an enduring sense of place. Please carry on with what you do so well, Lisa. Wish I could turn your wonderful words,into a river of gold,but it was ever thus for author/writers.Must be named a Rawling or Cornwell,or a “Garrulous Geordie”tramping the Fifteen Streets to get rich on it!Over the years you have covered almost all of York’s non-touristy streets and locations,and have appreciated each and every one. This piece on the Ouse ,with hill down to river,and top path with railing gave me goose bumps,remembering my1946 post war /waiting for School Certificate results,filling in time by tramping to The Ings,wth Cossie on,towel round neck,(via that top footpath,)and river swim/sun bathe before returning home “Commando Style”.Your words were evocative,and took me back there,filling in those hot sunny days,before engulfed by work responsibility’s,and economic necessities.thank you Lisa. Your words are evocative too Stephen, thank you for your comment, and your remembering, really nice to read that you knew that path. Haven’t seen anyone swimming or sunbathing there recently! Maybe when things warm up a bit. … Really nice to read these comments, Drake, AndyT and Stephen – I know you’ve all been visiting these pages for many years now, and it’s heartening to know that you still do, thanks for all your comments and contributions.